A man died in the driver’s seat of a car from an apparent gunshot wound on the Highway 520 bridge near Montlake Boulevard early Monday. The incident is thus far being treated as a homicide, “but further investigation may prove otherwise,” Trooper Rick Johnson, a State Patrol spokesman, said Monday. Detectives are still investigating but believe the public isn’t in danger, he said. Calls came in to 911 after a woman who was with the man got out of the car — which had been pulled over on the eastbound shoulder — and tried to stop traffic in the westbound lanes for help, Johnson said. Detectives have interviewed and released her, Johnson said. She told detectives she was in the car when the shooting happened, Johnson said. The woman’s relationship to the man is unknown at this point. The car, a Honda Element, had a bullet hole on the driver’s side of its windshield. The State Patrol is awaiting a search warrant for the vehicle to retrieve a gun believed to have been used in the shooting. The eastbound right lane and shoulder were blocked just east of Montlake Boulevard from about 5:25 a.m. to just after 11 a.m. Monday. 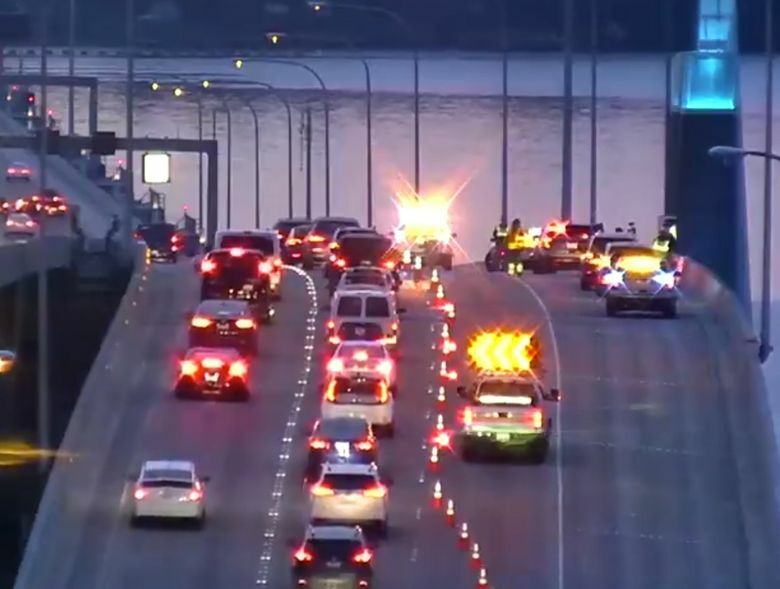 Eastbound traffic was down to two lanes, slowing the morning commute across Lake Washington.